New Delhi: As per the World Bank’s South Asia Economic Focus Spring 2018 report, Indian economy has recovered from the impact of demonetisation and the introduction of the Goods and Services Tax regime and is projected to grow by 7.3 percent in 2018 and 7.5 percent in 2019. On the other hand, The traders fear that GST will increase paperwork and make it difficult to maintain accounting books without hiring accountants, an additional burden for cash-strapped businesses that work on thin profit margins. On Monday, Federation of All India Vyapar Mandal, a national level body representing trade in India, had proposed Government of India to replace present GST with Single Point GST ( Ekal Bindu GST ). This concept got major boost when Prime Minister himself taken a cognigence and advised to give a presentation to Arun Jaitley, Finance Minister. However due to his illness, presentation on Single Point GST was given on 16th April 2018 to respected Hasmukh Adhia, Finance Secretary, Government of India. Single Point GST ( Ekal Point GST ) implies that entire GST be collected from last level manufactures on MRP of the product. After collecting entire GST from MRP from last manufacturer all subsequent traders like C&F, Distributors, Wholesalers and retailers need not to GST collection and or do any compliance on GST. Speaking to Ten News, V K Bansal, National General Secretary said, “as per as estimate of National Institute of Public Finance and Policy monthly optimum collection of GST should be around 1,10,000 cores of rupees, against which Government is so far collected only around Rs 80,000 to 90,000 Crores of rupees every month. Therefore still there is a deficit of 15% of optimum tax collection target”. “The main benefit of proposed Single Point GST is, Government can easily monitor a less number of GST tax payers i.e. manufacturers which will be hardly 10-15% of total present tax payers in goods segment. By less number of tax payers, capacity and operational efficiency of GST Network will automatically increase. Unhealthy competition by dishonest traders will automatically stopped as there is no chance for tax evasion by any trader now”, added Bansal. 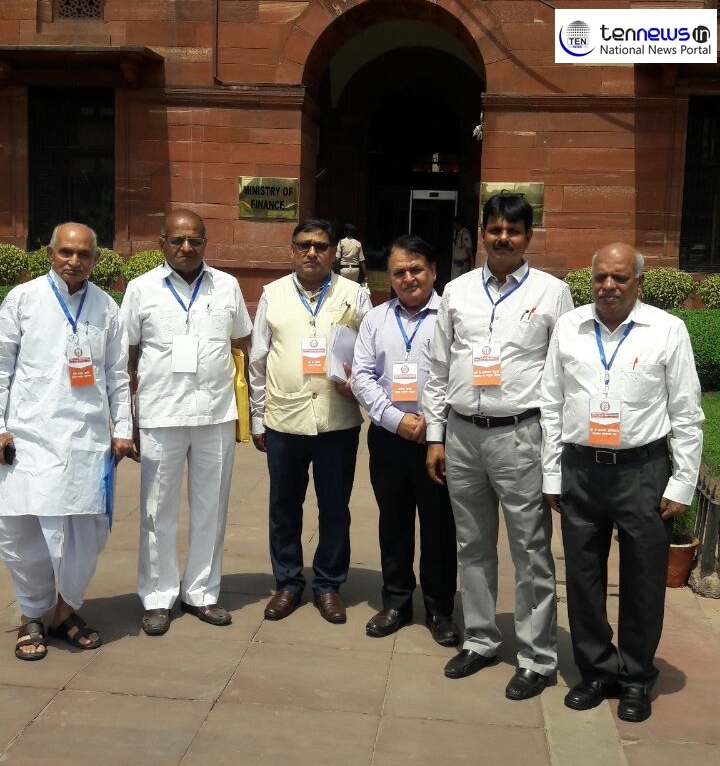 Delegation of Federation comprises of Jayendra Tanna, National Working President, Dr. V K Jain, National Convener, V K Bansal, National General Secretary, CA Rajeshwar Painuly Convener and National Spokeperson, CA Prakash Agiwal , Chairman Professional Cell and Radhey Shayma Sharma National Senior Vice President.